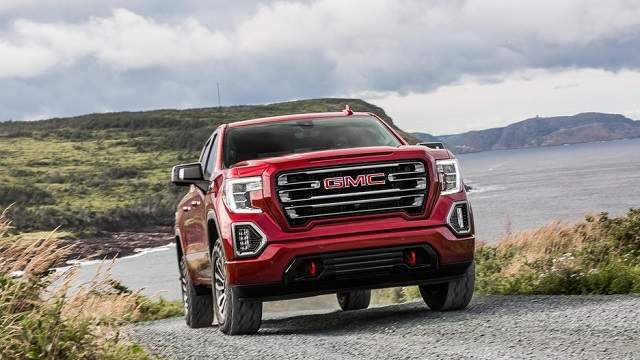 With the new generation of the pickup truck out for 2019 season, the 2020 GMC Sierra 1500 is not bringing too many updates. The upcoming model might not have as many options as we would like, so this could be a segment where the vehicle could expand. New features and possibly extra trim levels are all we can get from the 2020 year model. Well, we are still waiting for all trim levels and cab configurations to be released for 2019 Sierra 1500. So far, we can configure a pickup with only petrol engines. Diesel is a part of the lineup for the upcoming generation, so as for 2020 GMC Sierra 1500. Confirmed trim levels are SLT, AT4, and Denali. However, General Motors will add two, three, or even more versions both for 2019 and 2020 Sierra 1500. There are many more upgrades we will see in a year or so. One of them is a Denali Ultimate Package. We will choose one of three possible engines for the new truck. The 2020 GMC Sierra 1500 replaces the old entry-level unit, a 4.3-liter engine. Instead, the base truck is using a 5.3-liter powertrain. it is capable to produce 355 horses and 383 lb-ft of torque. General Motors is using the same engine for the Chevy Silverado 1500. Well, that is one of many reasons why these vehicles are usually called GM twins. Sierra 1500 is using an eight-pace automatic gearbox. Direct injection and fuel management system that shuts cylinders help the truck to achieve better fuel economy. The next-gen pickup adds 1 mpg both for city and highway runs. Besides this one, the 2020 GMC Sierra 1500 will come with another petrol engine. It is a 6.2-liter V8 for upper trims. Models carrying this unit are going to cost more. The powertrain is also offering extra energy – 420 horses and 460 pound-feet of torque. The same transmission sends power to either two or four wheels. Both configurations are available for the entry-level engine. A bigger engine consumes more fuel. The fuel economy of the new 2020 Sierra 1500 will be around 16/21 mpg. General Motors are not leaving a diesel market to its archrivals. Both Ford F-150 and Ram 1500 come with such drivetrain. These two trucks stole the show at NAIAS 2018 in Detroit. Chevy also presented its Silverado 1500 Diesel. GMC Sierra did it later at the solo event. However, we believe the company lost a lot by being late, although the same unit we saw in Silverado. The 2020 GMC Sierra 1500 Diesel is going to use a 3.0-liter Duramax drivetrain. With it, the truck can achieve around 240 hp and 420 lb-ft of torque. We still don’t know many details about it, including a transmission it uses, fuel economy, and towing capacity. However, expect this drivetrain to beat the petrol sibling in most segments. How Much Weight Can 2020 GMC Sierra 1500 Carry? Towing capacity of the new model will be slightly higher than on its predecessor. There are few factors, but engineers tuned the entire body-on-frame system to be more durable and capable for towing. So, owners of the 2020 GMC Sierra 1500 can count on at least 12,500 pounds with its bigger engine. A smaller block offers a towing capacity of 11.500 lbs. Specs of the diesel truck could top these numbers with proper configuration. While the entire truck industry is waiting for further updates for all full-size trucks for 2019, we can’t predict what is GM planning for the following season. 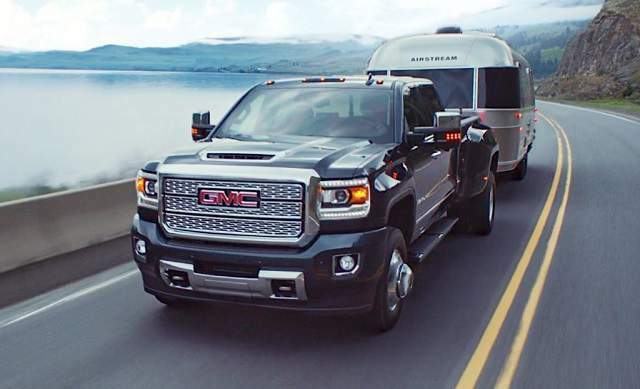 At this moment, we know the 2020 GMC Sierra 1500 is getting two engines, two drive modes, and three trim levels, available only in Crew Cab variant. Well, it is certain that Double and Single Cab will arrive sooner or later. These will be in an offer for 2020 season. Also, the short, long, and regular box will add more versatility and configuration options for GMC Sierra 1500. 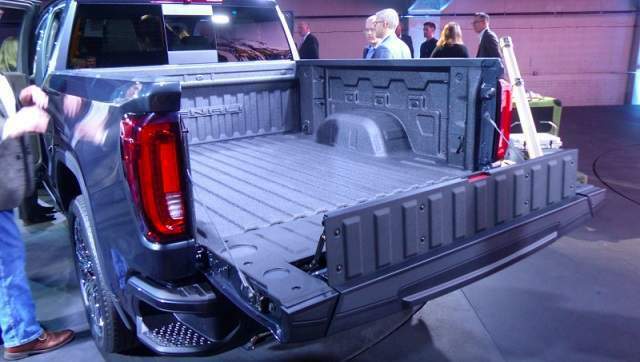 One of the major things that make 2020 GMC Sierra 1500 different from its Chevy twin is a bed. Both models are having a specific tailgate. 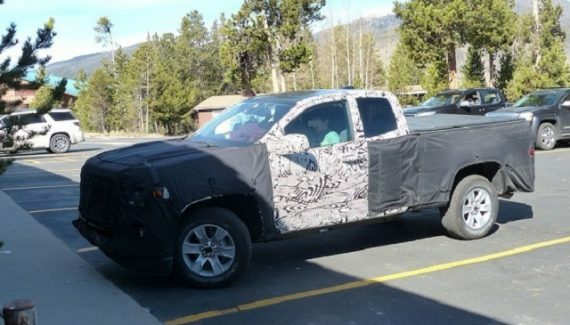 A six-way gate for 2019 Sierra will be in use for the next model. The classic tailgate can be set for oversized cargo by extending the bed. From this position, it is easy to switch this part into steps for simplified access. Also, drivers can set the tailgate into a working station, by folding only an upper part of the gate. The bed also gets a special carbon treatment. With it, you won’t need a bedliner to protect the surface. 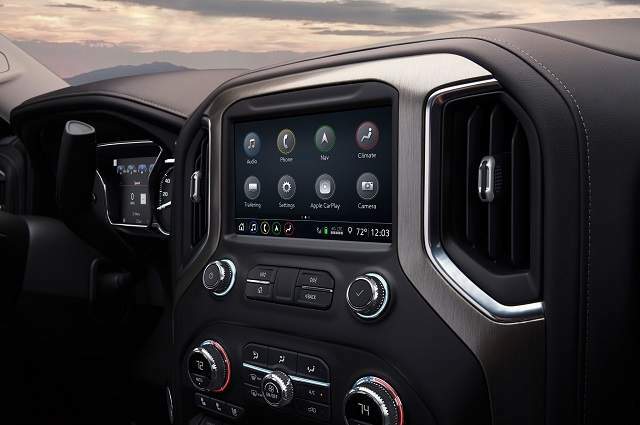 The top of the line model, 2020 GMC Sierra 1500 Denali, will offer more features. It belongs to the luxury lineup with a price significantly higher from the base. But, some SUVs could be jealous of its features and options. Dual exhaust and off-road traction mode are part of the drivetrain system. Wooden details and leather seats are boosting the interior luxury. You will hardly find posher truck than 2020 Sierra 1500 Denali. Seat heating, navigation, premium audio, large screen, and many more features come with this model. Whatsoever, you can still upgrade your ride with the 2020 GMC Sierra 1500 Denali Ultimate Package. A set of features include all items we will find in Technology and Driver Alert packages, plus extras. The Ultimate Package brings moonroof, 22-inch wheels with tire pressure monitor and aluminum rims. All-season tires are wrapping wheels. The pricing, at the moment, starts from $46,000 for the 2019 model. But, as said, the company didn’t release all trim levels and options. A 2WD model with 5.3-liter engine and Regular Cab configuration is going to be the least expensive option. We believe the pickup will be available from $31,000. Of course, top of the class trim level is Sierra 1500 Denali. Its price is going to start at $52,000. The company is unveiling detail by detail about the upcoming truck. With all cards on the table, only pieces will be left for 2020 GMC Sierra 1500. Small updates, extra trim levels, and other changes will have an introduction next year. A debut will happen late in 2019.